The relationship between leadership and literature is described by the learned as that of soul and body. 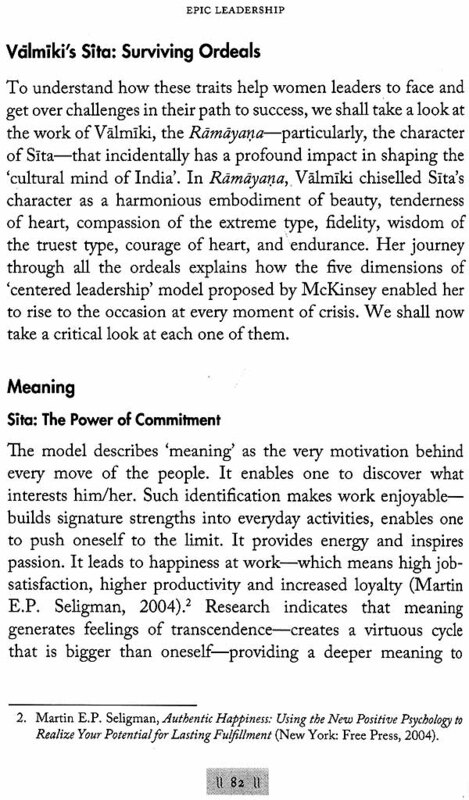 As Warren G. Bennis and James O'Toole argued, if fiction could be a best instructor of leadership and organizational behaviour, what best fiction could there be for leaders-in-the-making than the Ramayana familiar epic that is highly enriched by pathos, moral profundity and noble simplicity-to learn the complexities of leadership? It is against this backdrop that the present book attempts to combine and interlace the leadership/management thoughts of modem management Gurus with that of the experiences of characters from the Ramayana which have displayed streaks of leadership and present a perspective of what is and what is not effective leadership. The struggle of these unsparingly realistic epic characters, when read by business leaders, is likely to broaden their horizon of imagination and visualization of complexities embedded in leadership. It also affords better understanding of their own conflicts. Put together, all this paves the way for better leadership. Gollamudi Radha Krishna Murty, a postgraduate in Agricultural Sciences, is currently working for the IUP Publications (A Division of ICFAI) as its Managing Editor. Earlier, he worked at Andhra Pradesh Agricultural University, Rudrur, for five years as Research Assistant (Entomology) and later with the Bank of India for twenty-six years. During his stint in the bank, he worked for five years as Faculty Member at its Management Development Institute, Andheri, Mumbai. In 2000, he took voluntary retirement as Assistant General Manager from its Head Office. says the Mababharata. This dictum holds good even in the case of the smallest sphere of management/administration, the family, nay, one's own self, and the biggest sphere of administration, the state. It is true that a ruler or leader can control the times, but he can do so only when he inherits great virtues of the head and the heart, is given rigorous training through a proper atmosphere suitable for mental and physical growth, and correct education which supports and sustains the inherent virtues. That is the reason why there has been a continuous development and practice of the Nitisastra, the science which teaches good conduct and the methods of efficient and benevolent administration of the state and skilful management of the affairs at every level of human activity, in this great country of ancient civilization. The Nitisastra has laid down many principles that have been tested on the crucible of long practice over a period of many centuries and found beneficial to both the ruler and the ruled. The principles include (i) the three saktis (powers)-prabhu-sakti, the commanding power or leadership qualities; mantra- sakti, seeking and taking good counsel; and utsaha-sakti, to always be cheerful and engaged in activity; (ii) the four upayas (expediencies )-sama, the use of conciliatory methods; dana, showing some allurements; bheda, creating rift; and danda, inflicting. punishment; and (iii) the six gunas (measures)-sandhi, entering into a treaty; vigraha, maintaining enemity; asana, waiting for proper time or opportunity; yana, marching to attack; dvaidhibhava, to adopt double policy, friendliness with one and enemity with another; and samasraya, seeking the help of somebody else. And according to the Arthasastra of Kautilya (1.15), the subjects of deliberation (mantra) are: Karmanam arambhopayah: the means of starting undertakings; purusadravyasampad: the excellence of men and material; desakalavibhaga: apportionment of place and time; vinipatapratihara: provision against failure; and karyasiddhi: the accomplishment of work. While these and many other topics are discussed and explained theoretically in all the works of Nitisastra, which is otherwise called Rajaniti, Arthasastra and Dandaniti, the practical application of all these principles and expediencies can be found in the stories of the two great epics-the Ramayana and the Mababharata. In this very interesting collection of thirteen essays, C.R.K. Murty shows that many principles laid down and discussed by the modern writers in the context of management of different types of organizations of the present times have been discussed effectively even in such a remote period as that of the story of the Ramayana. He has selected wide and varied episodes and incidents from the Ramayan to explain the methods of management practiced in the corporate world m modern times. 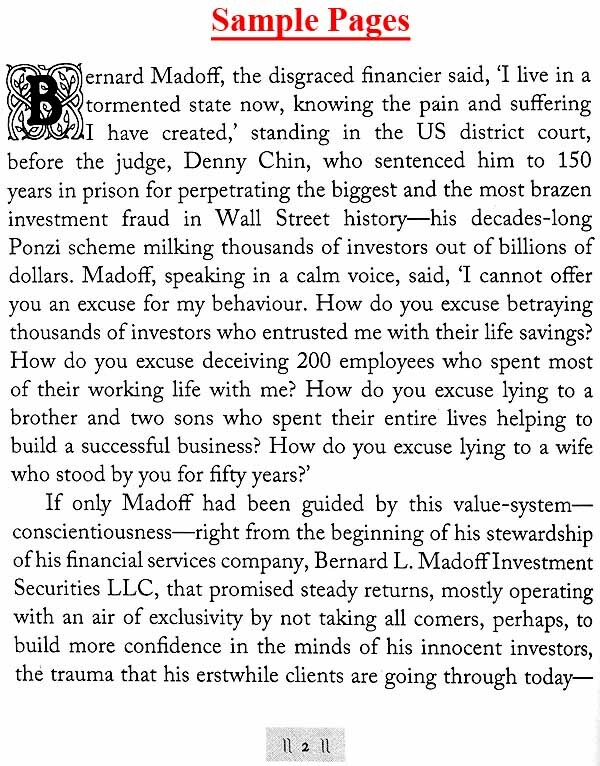 For instance, the first essay 'Truthfulness: The Need of Organizations' emphasizes the importance of truthfulness on the part of leaders with the example of Bernard Mad off, who was sentenced to 150 years in prison for perpetrating the biggest investment fraud. Contrasting the dearth of truthfulness in today's business world, the author draws the readers' attention to Rama's conversation with Lakshmana, Kausalya and Dasharatha before his departure to the forest, and shows how Rama chose to adhere to dharma and truthfulness even in the face of a suggestion by his father to stay back and take control of the kingdom by force, stressing that such transparency is very essential for the leader in all his dealings-be it then or now. Each essay explores different episodes of the Ramayana and highlights the leadership traits and aspects that interestingly correspond to what modern-day management gurus have got to say on leadership and management. 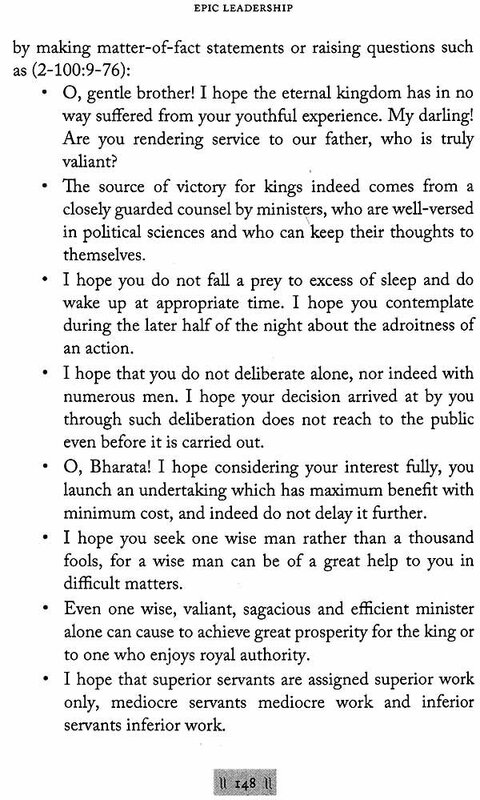 If the essay 'Leadership's "Toxic Tandem": Growing Angst in Downturn' highlights how power intoxication results in a series of poignant situations and creates anxiety of decline through the instance of Ravana's refusal to listen to the good counsel given by Maricha, his maternal grandfather Malyavan, and his brother Vibhishana against abducting Sita, the essay 'Decision Making: Drivers of Good Decisions' shows how Rama, when Vibhishana approaches him requesting for refuge, seeks the counsel of Sugriva and all other senior commanders in the army, listens to them, and after answering all the objections raised by Sugriva and others, finally extends his hand of friendship to Vibhishana, underlining Rama's integrated vision, typical of the 'integrative' process of decision making discussed by Brousseau, Driver, Hourihan ar Larsson. 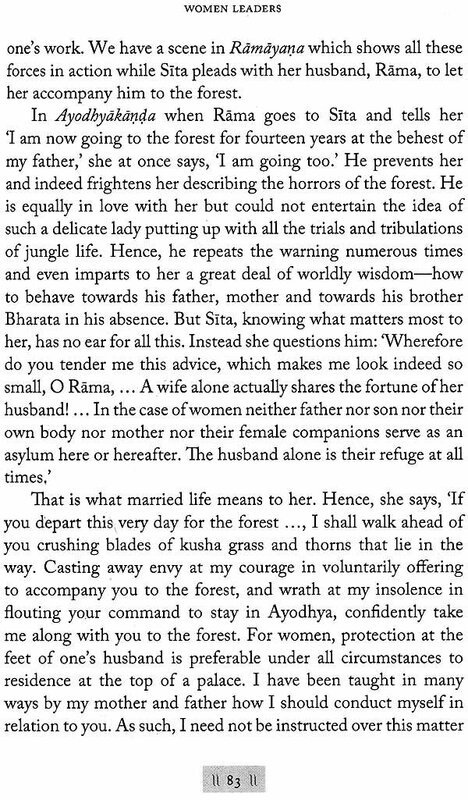 In the noble tale of Sita, who is 'innocent but wise; gent but strong; and full of love and compassion' which 'reflects : her motivations, conversations and actions,' the five elements responsible for the success of women leaders are highlighted the actions of Lakshmana and Ravana are compared are contrasted to show how all our problems, as Russell C. Ackoff put it, 'arise out of doing the wrong thing righter'; the striking contrast between how Rama and Ravana deal with the respective followers is underscored to show that knowlededge of the followers is very essential for the leaders for achieving success in their endeavours; Rama's ability to come out of tl difficulties by making good judgement, forging an alliance with Sugriva, granting refuge to Vibhishana and ultimately destroying his enemy is given as an example to show how winning leaders make great calls; and Hanuman and Vibhishana are presents as classic examples of loyal followers who, noting their leade’s intentions both explicit and implicit, perform not only what their master told them expressly, but also the other task that will have a bearing on easy accomplishment of the ma purpose. The Ramayana is the most popular and timeless Indian epic read and loved by all. As a literary work, it combines 'the inner bliss of Vedic literature with the outer richness of delightfully profound storytelling'. 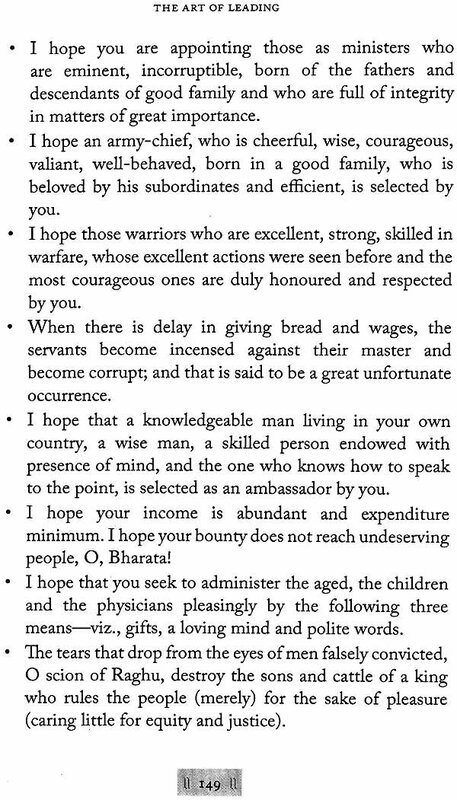 As Aurobindo observed, it has indeed 'fashioned much of what is best and sweetest in the national character' of India. It is considered as a unique literary treasure, for each of its characters present one aspect of human philosophy. Within it seers have noticed cravings for something greater than everything in beauty, morals and reverence. 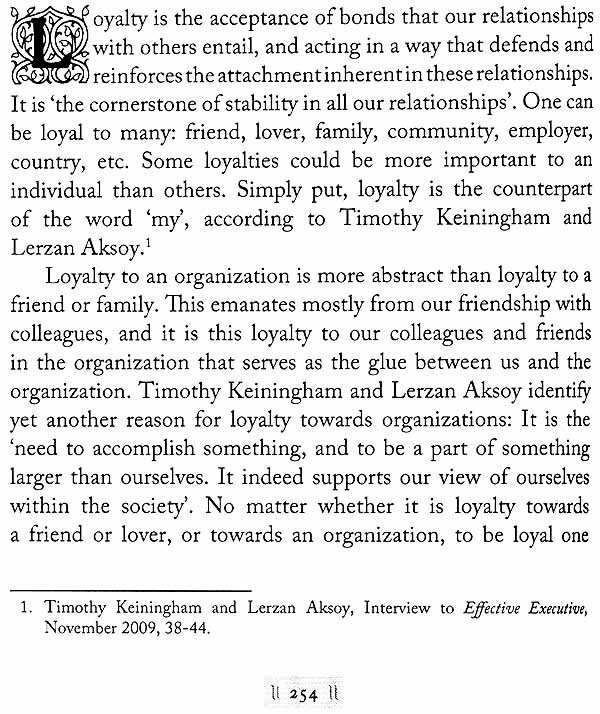 Driven by this belief, pundits have all along been expounding its ennobling influence in defining the relationships of people as parents and children, husbands and wives, brothers and sisters and teachers and pupils to the hilt. However, its influence in defining the relationship between the leader and the led has not been deliberated upon, at least to the extent the rest of the relationships have been meditated upon, though the epic extensively dwells upon leader, leadership and its 'dharma'. Although we all know that a leader is essentially meant for getting results, effective leadership is still wrapped in mystery. Daniel Goleman has however proposed that there are six distinct leadership styles: coercive leaders, authoritative leaders, affiliative leaders, democratic leaders, pacesetting leaders and coaching leaders-each one of them emerging from different components of emotional intelligence. His research further indicates that leaders who accomplished best results do not rely on anyone leadership style but 'a collection of distinct leadership styles- each in the right measure, at just the right time'. Further, he asserts that the art and science of leadership can be learnt. According to Tom Peters (1996), Warren Bennis (1996), Bennis and O'Toole (2005), Chartier Bob et al. 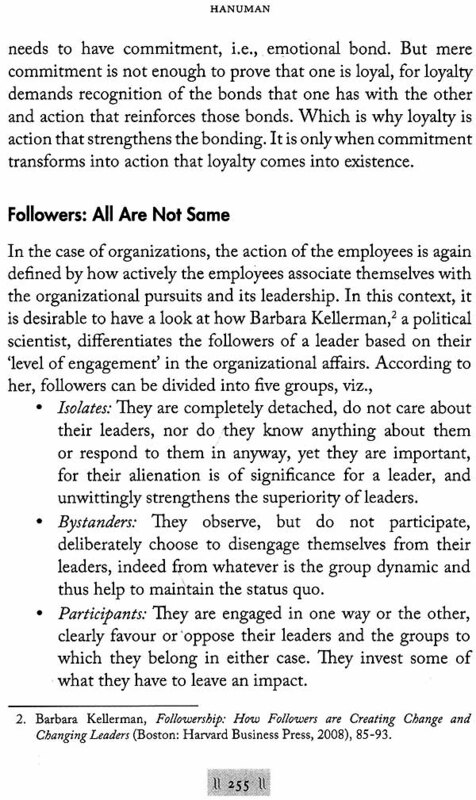 (2005), and Joseph L. Badaracco, Jr. (2006), one sure way to perform better by prospective leaders/leaders is to acquaint themselves with the Classics to broaden their horizon of imagination and visualization of complexities embedded in leadership and acquire insights to handle them from the experiences encountered by the fictional leaders. Against this backdrop, an attempt has been made in this book to trace the teachings of Valmiki in explaining the conduct of leaders like Rama, who conducted himself with pathos, moral profundity and noble simplicity, and Ravana, the ambitious king to whom nothing mattered except his self-good, in the pursuit of which he made loyalties, moral scruples, and human feelings subservient to his own interest and analyse them from the perspective of 'leadership' as understood in today's management theory with a hope that its loftiness would educate the prospective leaders regarding what effective leadership is all about. And the radiating 'Beauty, truth and rarity, Grace in all simplicity' of the Ramayana is sure to make a reader meditate upon these simple truths of leadership and imbibe the good of 'wisdom leading the power'. Leadership is as old as civilization. It has engaged the attention of the best of intelligentsia from time immemorial. Though many researchers have spoken on leadership, as James MacGregor Burns, Warren Bennis and Henry Mintzberg argued, no satisfactory definition of leadership is available even today. It is often looked at from a 'great man' perspective. For quite long, brawn and muscle were treated as the principal qualifications of a leader. It indeed took several centuries for people to realize that no person will work effectively, unless he likes his leader-after all, people may submit to cruel force, but always reluctantly and unwillingly. The idea that the basic urge for freedom of action and a sense of satisfaction is fulfilled only by a state of 'laissezalter' has slowly gained momentum. It is perhaps in recognition of this simple truth that leadership has emerged as the linchpin of the management of modern organizations. According to Jago (1982),1 leadership is a process and a characteristic. The leadership process arises from the use of a non-coercive influence to direct and coordinate the activities of the members of an organized group with a view to achieving group objectives. In 1985, Warren Bennis and Burt Nanus opined that leaders lead by pulling rather than pushing; by inspiring rather than ordering; by creating achievable, though challenging, expectations and rewarding progress towards them rather than by manipulating; by enabling people to use their own initiative and experiences rather than by denying or constraining their experiences and actions. In 1995, Boyett and Boyett revisited the concept of servant leadership, saying that leaders are servants first, lead by listening to their followers, help people articulate their own goals, inspire trust and take people and their work seriously by exhibiting commitment to employee growth, development and ability to be self-led. Later in 1996, John P. Kotter came up with the idea that leadership means 'establishing direction, aligning people, motivating and inspiring them to change by satisfying basic but often unfulfilled human needs'. Then, as the icing on the cake, Collins (2001) came up with the idea of Level-S leadership that 'builds enduring greatness through [a] paradoxical blend of personal humility and professional will'. We thus have a stream of leadership theories emanating from different quarters from time to time. Nevertheless, every organization requires a certain level of leadership skill for its management, since it is the skill of an organization to harness the employees' competences and knowledge that determines its success (Armandi et al., 2003). Essentially, a leader is one who leads the organization. Which is why it is strongly believed that it is the overall character of a leader that plays an important role in leading people. Gen. H. Norman Schwarzkopf once said, 'Leadership is a combination of strategy and character. If you must be without one, be without the strategy.' That is the importance of 'character' in exercising leadership. This character is often considered to be a given. Piaget? said that children as species are equipped with a characteristic mind. He, however, believed that a gene's meaning depends heavily on its context with the environment around it. According to him, it is the active engagement of the mind with the surroundings that enables the individual to assimilate predicted experiences and use them to interpret unexpected experiences. Thus, though all the determinism is built into the initial wiring of the brain, experiences with the surroundings refine the individual's brain and may even rewire the initial setup. In other words, we can say that nature is our internal guide but nurture is the final explorer that determines what we do. It is thus clear from the foregoing that the essential attributes of a leader's character-such as 'trustworthiness, fairness, unassuming behaviour, capacity to listen, open-mindedness, sensitivity to people, sensitivity to situations, good judgement, broadmindedness, flexibility and adaptability, the capacity to make sound and timely decisions, the capacity to motivate, sense of urgency and initiative'-can be learnt by every leader. But the question is, how are organizations to nurture such essential attributes/transcendental elements among the prospective leaders? The importance of this question gets accentuated when one juxtaposes it with the observation of Warren Bennis: 'The world is least aware of the "quiet crisis" of leadership that is all-pervading today. We don't yet know what will happen with the walking away of the present generation of leaders, nor do we know how to nurture the next generation of leaders with an enduring character exhibiting new capabilities needed for navigating through the "changing times" safely.' There is, of course, no single answer to these misgivings. This obviously compels businesses to look off-centre to find a best-fit framework for developing leaders in the organizations. That aside, there is yet another disturbing phenomenon that has crept into today's businesses: the world is angry at the mess created in the global financial markets by the business leaders. It is well captured by Nitin Nohria, the dean of the century-old Harvard Business School, when he said, 'Throughout history, there has been this notion of the honourable business person. Business people have taken pride that they can do business on a handshake. I don’t know where we lost that...’Similar feeling are echoed by Drew G. Faust, President of Harvard University, when she said HBS students are ‘very concerned about the image of business and its place in American life and the world in general’. 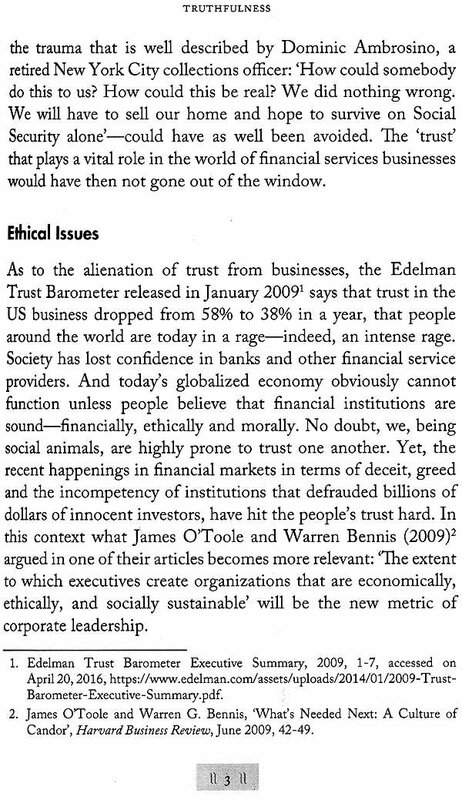 The general mood is that business leaders ‘lost legitimacy’ to manage them in the past decade.